Professional Engineering Co., Inc. – Suspended Ceiling Wire Cutters – Cut down twice the ceiling grid in the same time! Over 25 years of manufacturing the highest quality state-of-the-art demolition tools with worker safety and efficiency as our guide. Made in the USA. Wire Wolf™ now ships internationally! Work smarter, not harder with our tools anywhere in the world! Click below to shop the highest quality state-of-the-art demolition tools! TileREX™ removes ceiling tiles from suspension grids whole without breaking them, making palletizing for recycling programs easier and can be used from the floor, increasing productivity and keeping your workers safe. 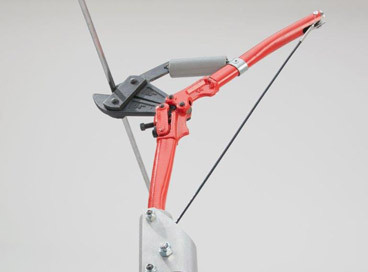 With a patented wire feed design easily guiding the bolt or wire safely from the edge of the ceiling opening, the Sabertooth® Bolt and Wire Cutter cuts 1/4″ threaded rod used for suspended ceilings, sprinkler pipes, HVAC, cable trays and plumbing safely; no climbing, and no struggling with metal support bars. PECI manufactures a line of the highest quality state-of-the-art demolition tools with worker safety and efficiency as our guide. 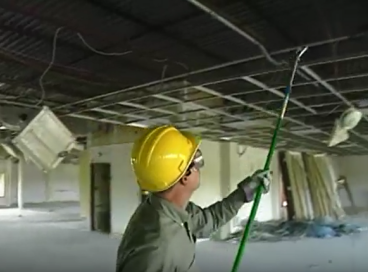 A revolutionary, patented demolition tool engineered to safely cut down suspended ceilings from the floor - eliminating the need for ladders and staging and reducing the risk of injury. 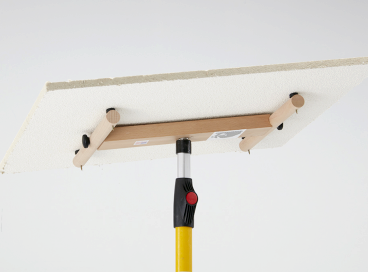 Our suspended ceiling tile removal and recycling tool can make your next ceiling tile removal job safer and faster; engineered to safely remove suspended ceiling tiles from the floor – no ladders or staging required. Our Bolt and Wire Cutter cuts Jack Rod or 1/4" threaded rod used for suspended ceilings, safely up to 7 feet away from the edge of the ceiling opening without climbing on top of it. Our new tool for dispensing trim coil. BigHorn trim coil dispenser will help save wasted material and make your job site more efficient. Professional Engineering Co., Inc.’s mission is to provide its customers with assurance that we manufacture the highest quality state-of-the-art products with worker safety and efficiency as our guide. Copyright © 2017 Professional Engineering Co., Inc.